Come along to my home and enjoy 1 to 1 or group tuition. Learn how to use pastels. I offer tuition from Monday to Friday from 9.30am to 2.30pm and evenings. I can tailor your tuition to suit you and what you’d like to achieve. Prior to taking up art as a profession I was a private tutor and teacher for 11 years teaching children with specific learning difficulties. My specialist training in this field helps me teach art to people of all ages with the understanding that we all learn differently. I am able to adapt my teaching to help you gain skills and techniques to work in pastel or graphite confidently when you go home. Enjoy 1 to 1 tuition to learn how to paint your pet. You will go home with a portrait of your beloved pet. You need to provide a quality photo of your pet and I will supply everything else you need – pastels, pastel pencils, paper, board, easel. I will provide lunch and refreshments throughout the day – please let me know it you have any specific dietary requirements. To book or discuss further you can contact me on 07740 282399 or email sue@skhportraits.co.uk. Would you like to learn how to use pastel but you’re confused by all the different pastel brands and types of paper? It can be awfully confusing with the sheer amount of pastel brands and paper types available. You’ll go home with a selection of different papers and a set of soft pastels included in the price. This is a 1 day workshop that can be upgraded to a 2 day workshop if you’d like more practise with pastels and paint something of your choice. To book or discuss further you can contact me on 07740 282399 or email sue@skhportraits.co.uk. The first day is £135 and the second day £115. Payment can be made via BACS, cheque or cash, 20% deposit to book your place. This workshop can be taken as a group: First Day: group of 2: £85 each, Group of 3: £70 each. Second Day: £65 each, a group of 3 £85 each. I have gift vouchers available to purchase for all my courses. Please contact me to arrange payment and delivery address. 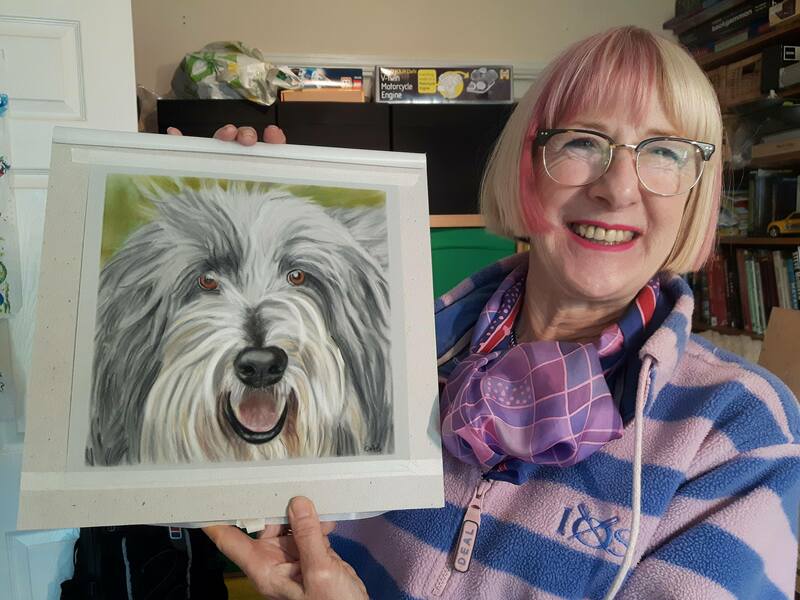 Day 2 – Carol has finished her portrait and talks about what she has learnt. Beginner in pastels. Towards intermediate in water colours and drawing. Have you used soft pastels / velour paper before? Soft pastels a few times, velour not at all. What were you expecting from your 2 day course? To learn how to use soft pastels, to experience velour paper and to produce a “good” painting. I assumed with 2 days I would progress, which I did. I took that it would be enjoyable as a given. Is there anything in particular that you learnt during the 2 days? How to approach producing a pastel painting and how to use the pastels. Do you feel motivated to go home and use your pastels? Very definitely. I was so happy with the result I posted it on Facebook and I ordered some velour paper. I already have some good pastels. On a scale of 0-10 where 0 = not at all and 10 is much more than I expected, how much do you feel that you now have the knowledge to go forward and improve? Do you think you now have the ability to go home and confidently practice what you have learnt? Are you pleased with your finished painting? Very pleased. I have shown it on several social media sites and talked about it a lot. Would you recommend me to your friends/family? I certainly would. I mentioned you in my Face book posting. If you did a course with me again is there anything you would like me to do differently or include? Not from the teaching point of view but I would like to choose the subject matter. How would you describe yourself as an artist? I.e. medium you use most and ability. How does your ability compare to what you produced in the lesson? I would describe myself as someone who knows a lot about how paintings can/should be produced but am not always able to achieve this. So far I have only worked in watercolours and to a small amount in pastels. I like to draw so use charcoal and graphite. I have never produced a picture with the likeness or density or layering like this one. The lesson also taught me a lot about myself, like I have to be more patient in the production of a picture and that breaking the work into small segments makes it much more approachable and easier and certainly less challenging. I also appreciated working on a 1-2-1 basis not only from what I learnt but also the intensity and the enjoyment of it as well, of course, as the finished work.